Congratulations! You passed your exam and have successfully earn your PMI certification.This is a tremendous accomplishment. I have really worked hard to see the above words in the prometric centre monitor. Oct 6th is one of the important dates, that I will remember forever. Thank you God for your continuous love and blessings. I have made a statergy to complete 50 Questions per hour. And hence I have 4 milestones for the 4 hours long test. I am able to complete only 40 Questions for the first hour. However, I am calm and relaxed as I am confident that I can complete the 200 Questions in four hours. I have read the Questions 2 or 3 times to identify/understand all the twists and turns and the keywords to give the right answer. I have finally completed all the 200 Question just two minutes to spare. I waited for the time to elapse to proceed for survey. Book* --> Each and every chapter have 20 to 30 Questions. How I ensured that I am ready for exam ? I have consistently scored 75% and above in the below 200 questions full Mock Exam. 1.Read only PMBOK and Rita and it is not required to refer other books. 2.You can read 2 or 3 times and try to understand each and every line written in the book. 3.You can refer iZenbridge Saket videos to understand the PMBOK ITTO and PMP concepts better. 4.Please refrain using free PMP MOCK tests that are available in the internet. It will confuse your basic PMP concepts and shake your foundation. 5.You can rely on paid PMP Training sites like iZenbridge and PMTraining [Christopher Scordo]. 6.We need to understand all the concepts / ITTO to clear the exam. Memorisation won't help you to clear the exam. 7.Whenever you give wrong answer, please read the explanation given by the Author and understand it. Eventhough you have given right answer [ Especially for the Questions like Next Thing, Firtst Thing, Best Thing], please read the answer justification given by the Author. 8. Give all the Exercises given in the Rita book sincerely with dedication. 9. Read all the "Tricks of the Trade" in the Rita book. 1.Before you start the exam close your eyes and observe your breath for 3 times. 2.Whenever you find a difficult or complicated question in the exam just close your eyes and observe your breath for 3 times. 3.It will calm your mind and keep you focussed on the exam for four hours. How iZenBridge helped for my PMP success Journey ? PMP® Queries and Tips [ iZenbridge Forum ] - It have helped me a lot to understand PMBOK better. Special note of appreciation to Saket Bansal, Manish and Seema. 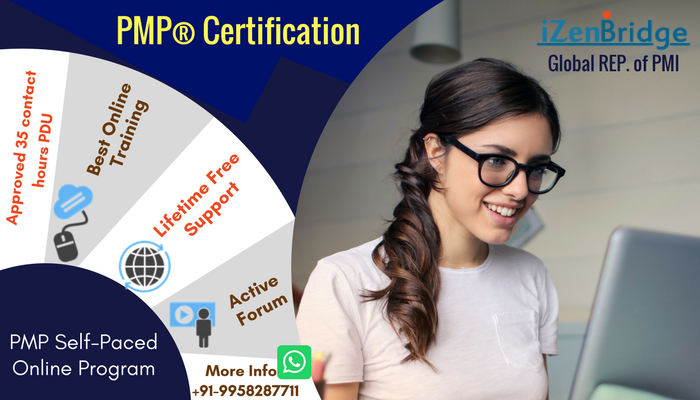 PMP® Exam Prep Questions [ iZenbridge Forum ] - Whenever I come across a question that doesn't have a convincing answer, I search to get the expert opinion. It have really helped me a lot to answer many questions correct in the Exam. PMP® Exclusive Webinars [ iZenbridge Forum ] - Perform Integrated Change Control & Closing Webinars have really helped me a lot to understand the concepts better. iZenBridge Chapterwise / Mock Questions [ Quampus ] - iZenBridge have a good set of PMP questions that have helped me to analyse and investigate the gaps in each knowledge area. iZenBridge Saket Videos - Saket white board training is Awesome. It have really helped me to digest the concepts / ITTO in the PMBOK easily. Specail note of appreciation to his brilliant explantion and efforts. I strongly recommend iZenbridge videos / materials for the PMP preperation to my friends and family. 1. I take this oppurtunity to Thank the iZenBridge team Saket, Seema and Manish. You guys have done a brilliant job in making my PMP journey easier and comfortable. 2. I would also like to Thank our mentor Ravichandra PMP for helping, guiding and coaching in his busy schedule. 3. Special note of apprecaition to all my PMP study group members with whom we have lots of good learnings and discussion. 4. Thank you God for your blessings. If you have sincere dedication and commitment, you can do it. All the very best for the future PMP exam takers. First congratulations for passing PMP certification exam. Could you share your PMP study plan? ( How many hours your studied during weekdays and weekends etc). Is it really required to read Rita? I get conflicting advices about referring to Rita. Some are for it and some are against it. My only source is iZenBridge Videos and PMBOK Ed5. Reading PMBOK itself is taking so much time.